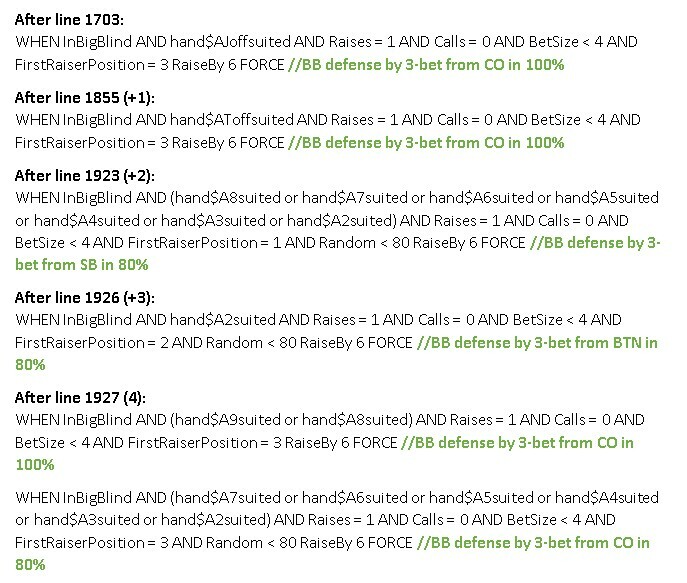 After that i going to review more hand, found another one interesting line in f$flop (for example, 634). But because I added a new line to the function, i need to account this shift on +1 line below (this line is Line 635 now because i add 1 new Line earlier). So my question is: how easy to add new lines of code without manually counting changes in the number of lines of code? Is there any solution? i think we need to keep a copy of the exact version of the profile that was being used to generate the log files on a given day. i make a folder for each day, put associated log files and profile version in there. If you're an out of control on the fly programmer like I am it can at times be a challenge to keep the log files and code in sync. 3) When implementing an updated version follow these steps, assuming you did step 2 above. d)Create a new version subfolder and put a copy of the new profile in there and implement it in the Botlogic folder. We would never edit the current "live" version in the Botlogic folder except on-the-fly emergencies, right? In reality I create subfolders of the log files occasionally and copy the profile ctrl+c then ctrl+v before major changes. Many times you can use the line number relative to the symbol and a little logical analysis to identify where the offending line moved too. i do something similar to what rudeone suggests: in notepad i keep one tab with unchanged version of profile (which generated logs), then i find my line and search for it in 2nd tab, where there is new profile version. I never make a change to the bot without saving it with a new version number. Problem solved. Easy peasy. When reviewing my logs, I look to see what version of the profile I used (it's at the start of each hand). Done. QED. And all that. Good Morning. Can someone give me an efficient line to play with two pairs formed on the flop. This is why profiling is difficult. It's not just hitting two pairs that's important. There are many factors to consider when considering the next move. The way I would go about this process is to create a template of circumstantial situations that would make the play different with each situation. How many players are at the table? How many players are left to act? Is there a bet to call? Is it just twopair or is it toptwopair? Is there a possible flush or possible straight on the board? These are all things to consider when coming up with a proper code block. There is no one size fits all type of approach to a decision. Not all hands are AA where you can get away with a simple RaiseMax.